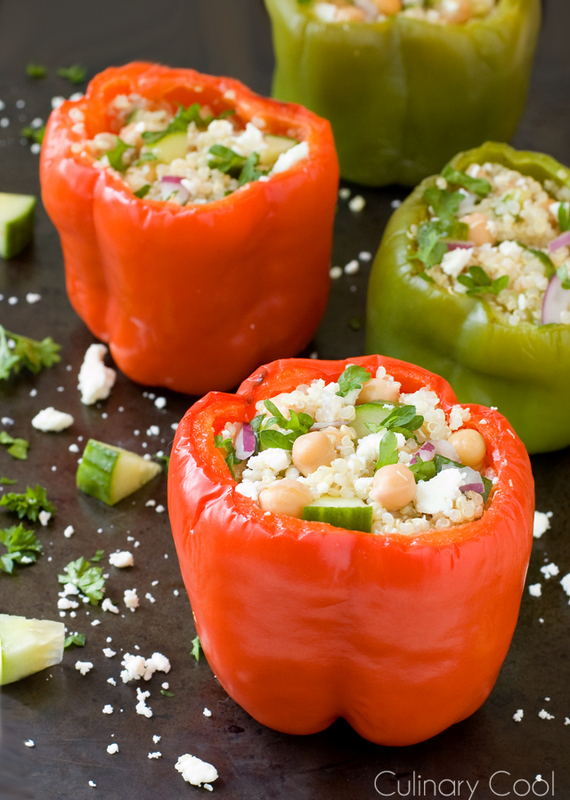 This recipe is a simple, meatless meal that is loaded with Greek flavors. ‘Round here, I’m usually solely responsible for thinking of supper ideas. So when my boyfriend suggested stuffed peppers (something we have never made before) I was shocked. For one thing, I have no idea how he even knows what a stuffed pepper is. His culinary prowess is limited to eggs, grilled cheese and something we call Salsa Chicken (which is just salsa on a chicken breast). How could I say no to such a great suggestion. So I ran with it and created this recipe using items I already had on hand. So there I was, rummaging through the pantry, digging in the fridge, trying to figure out what to stuff these suckers with. Then, I happened upon the Costco-sized container of feta, and like all cheese, it was calling my name. So obviously I had to use it. After some deliberation, I settled on a Greek salad inspired stuffed pepper. There are lots of recipes kickin’ around the internet for stuffed peppers, most of which require them to be baked once stuffed, but this one only requires the peppers to be heated (prior to stuffing) until they are tender, but not charred or mushy. The ingredients are simple, familiar, and uber healthy, and pack a flavor punch that you wouldn’t expect. It’s the perfect dish for meatless Monday and any hot, summer evening when you don’t want to eat a warm meal. Cut the tops off of the bell peppers and remove seeds. Roast in the oven until tender,about 10 minutes - watch them carefully - remove before they are charred. Cool completely. In a saucepan over high heat, combine quinoa and water and bring to a boil. Reduce heat to medium-low, and continue cooking for about 10-15 minutes. You should see tiny spirals separating from and curling around the quinoa seeds. Let sit for 5 minutes. Add in the red onions and garlic and mix to combine. Set aside to cool. In a large bowl, combine chickpeas, feta, cucumber, lemon juice, olive oil and Greek seasoning. Mix in cooled quinoa and stir to combine. Add salt and pepper to taste. 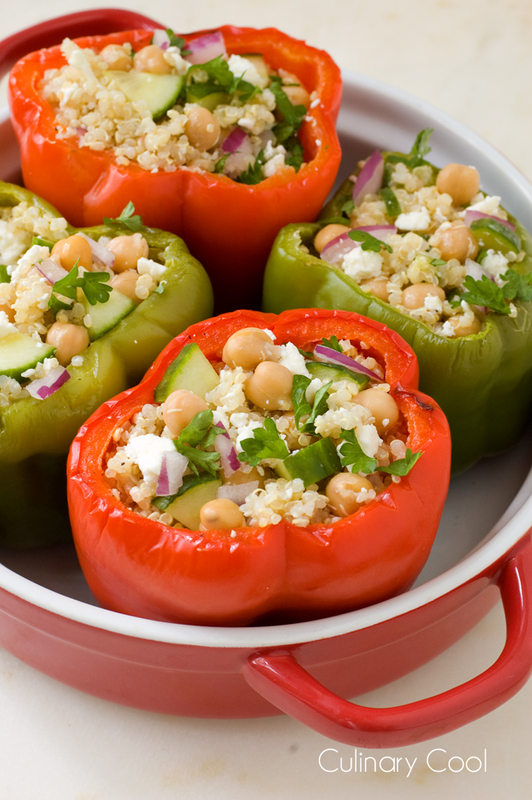 Once the roasted peppers have cooled, fill with the quinoa mixture. Serve chilled** **If you wish to serve these hot, use eggplant or zucchini in place of cucumber and roast in 375 degree oven until headed through.